Can someone explain me why it happens? I always use the virtual calculator as "beta tester" for my programs, because is easier and quicker to write, save and test, but now i'm getting different behavior, I'm confused. The program provided doesn't work on either the physical calculator or the virtual calculator. There are several changes that could make this program run without error, which you might find useful. 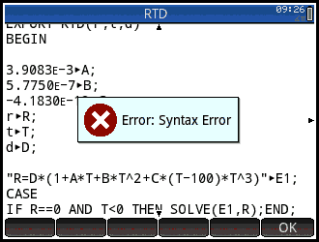 Before suggesting anything, though, it would be helpful to provide an example of r,t,d input values, and a known result, (to confirm the program's output). The program is working on my real calculator with no problem. the purpose of this program is to check and calibrate thermocouples. As far as I can see, your program relies on the active app being "Solve". Try pressing Apps, selecting "Solve", then "Home" and enter RTD(0,26.5,100). Maybe i'm not well explained. My program works well on my physical calculator, I have no problem with that. The problem is on Virtual Calculator on PC. I'm asking about the difference between physical and real calculators, both of them updated with the latest software version. 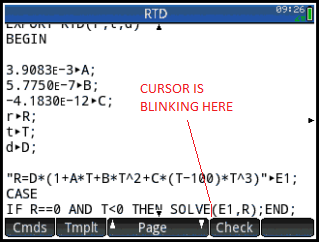 I set the active app to Solve, as Didier suggests, and the program does work, then, on the virtual calculator, with RTD(0,26.5,100) as the command entry line. 110.40 is the displayed result, and the Solve Symbolic View, E1, shows up as R=D*(1+A*T+B*T^2+C*(T-100)*T^3). That was probably your design intention, so, I can confirm it works on this virtual calc, at least when Solve is the active app. STARTAPP() and STARTVIEW() might also be useful for you. As stated, the issue here is you are mixing application variables/functions with a global program that may or may not be active. Is there a specific reason you are trying to store things into content of the Solve application? If so, the best way to handle things is make a copy of your solve app, and then put your program in the application program source file. If you don't need the solve app, I'd recommend using the FNROOT command which is the correct global root finder. If you want to keep it as a global program, and also want to blow out any content in the Solve app's E1, just qualify your call to the app function SOLVE. Quote: If you don't need the solve app, I'd recommend using the FNROOT command which is the correct global root finder. I checked in the manual, but the explanation of this command is very poor. My equation have many variables and needs to be solved for two of them, according to the requirements. can you, if you can, make an example? moreover i repeat my question: why the same code is working in my real calculator and is not working in the virtual? Maybe some wrong setting? If yes, where I can check? This would remove a lot of dependencies and most likely make things work better for you. Although I work for the HP calculator group, the views and opinions I post here are my own. I do not speak for HP. (10-05-2017 07:34 AM)simone_71 Wrote: moreover i repeat my question: why the same code is working in my real calculator and is not working in the virtual? Solve.SOLVE fully qualifies the command and tells the system where to look. You currently have a dependency on the Solve app being active to use your program. Solve.SOLVE replacing "SOLVE" would fix it. SOLVE is basically identical to FNROOT. You aren't simultaneously solving with SOLVE - it can't do that. FNROOT is a drop in replacement in your source and will have no dependency on the solve app. If you got rid of storing into E1, you'd no longer be using anything in the solve app.